The all-new 2014 Corvette Stingray Convertible has been unveiled at the Geneva auto show. Chevy has been keeping the top details secret from the media and fans, but it has now revealed the top and it comes with a twist. The new Corvette Stingray’s top is now power actuated and can be remotely operated. The new 2014 Corvette Stingray Convertible top design also comes with a quandary. Which is the most cool way to drop your ‘Vette’s top when exiting a restaurant? The first way would be to exit, see your car parked nearby by the valet, who is showing it off to other patrons and be sure your date sees it too. Then without removing your hand from your jacket pocket press the key fob that drops the top remotely. The Corvette will be ready for entry as you approach. In our second scenario, one would simply walk to the car and enter, but then while driving away, hit the top button to drop the top while accelerating away. The new electronic top can be operated at speeds up to 30 mph. We will add this cool roof to the Corvette's other 5 shocking features. The 2014 Corvette Stingray Convertible also has some design elements that cannot go unmentioned. There is a lifting and sliding hard composite tonneau cover that moves aside to allow the top to go up or down. This is a classy element. Convertibles with visible inner workings are low-rent looks. The cover may also be an aerodynamic necessity for a car that can travel at nearly 200 mph. Behind the seats there is also a black composite accent panel that will aid both looks and wind management. Viewed from above thee is a definite Batmobile styling that really looks special. The seats have nacelles behind them on the hard tonneau cover that set off the design in a Mark 5 sort of way. Between the nacelles the body color is drawn down into the interior between the seats. All 2014 Corvettes will have the same world-class mechanicals. The Corvette will have the same “LT1” pushrod, V8, direct injected powerlplant as hard top ‘Vettes. It will also have the all-aluminum space frame design. Steel is out for 2014. Carbon fiber is in, and in a big way. The entire hood and other parts of the car are made from this exotic, lightweight material. Without any unnecessary teasing, Chevrolet revealed that indeed the Z51 performance package can (and will) be applied to the new 2014 Corvette Stingray Convertible. The main addition of this package is a limited slip differential, but there are other benefits as well. 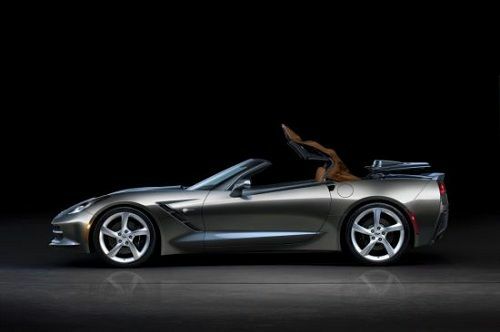 The all-new 2014 Corvette Stingray Convertible will be available in “Global Markets” in late 2013 according to GM. Hopefully, the car will be available domestically sooner so that GM does not miss a convertible driving season.